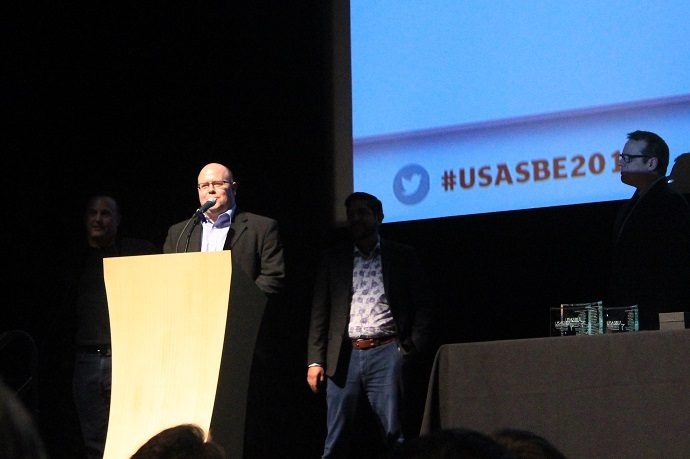 Alex McKelvie, associate professor and chair of the Whitman School’s Entrepreneurship and Emerging Enterprises department, accepts the National Model Program award at the United States Association for Small Business and Entrepreneurship annual conference in Los Angeles, California. Professor McKelvie adds that the award would not be possible without the unwavering support of the Syracuse University and Whitman School leadership teams. “This award truly is a reflection of several years of team effort and investments,” he says. Previous award winners include the University of Arizona, Babson College, Texas Christian University and Baylor University, among others. The Whitman School’s EEE program, which last year taught a record-breaking 3,000 students at the undergraduate, master’s and doctoral levels, is unique through the creation of its four teaching tracks to prepare students for future careers in new venture creation, corporate entrepreneurship, social entrepreneurship and family business. This allows students to be well-suited for the unique challenges in any entrepreneurial setting, whether it is in new or old companies, small or large organizations, not-for-profits or family businesses. Its undergraduate curriculum combines classroom time with experiential learning opportunities and real-world business practice. Culminating in a senior year capstone experience where all students start a high-growth new venture and present it to a panel of external judges, EEE students gain invaluable hands-on experiences through intensive and interactive group-oriented projects. The one-year M.S. in entrepreneurship (MSE) program is designed for students who want a “mini-MBA” with a key focus on entrepreneurship. There is also a newly created online master’s degree, Entrepreneurship@Syracuse. Both programs offer a rigorous entrepreneurial immersion with a large number of hands-on experiential learning courses. Aimed at developing the entrepreneur within, the Falcone Center for Entrepreneurship serves as the cornerstone of Whitman’s top-ranked Entrepreneurship and Emerging Enterprises program, helping to facilitate entrepreneurial activity on campus, as well as across local and regional communities. A recipient of the NASDAQ Center of Entrepreneurial Excellence award, the Falcone Center provides valuable entrepreneurial resources through the Couri Hatchery business incubator, the WISE (Women Igniting the Spirit of Entrepreneurship) Business Center, the South Side Innovation Center and veteran’s entrepreneurship training, such as the Barnes Family Entrepreneurship Bootcamp for Veterans with Disabilities (EBV) program.